I jumped at the chance when the weather heated up a bit to dress more for summer than winter. OK, so maybe I overdid it but at work I had to go out and about to do various things so that meant I could enjoy the sunshine. Woo! I'll be glad to carry this look through the weekend since I'll be in LA and temperatures are in the 80s! UHM...yes please! it definitely felt like summer in sf yesterday... well and here too. I had to stop into a couple stores downtown before I left and was completely sweating lol. it was HOT. Love this summer look and the mixed prints. I love how bright and fun this skirt is. It sort of reminds me of Pebbles from the Flinstones, in the best way possible! The skirt, the shirt the shoes love it! Lovely summery outfit! Like those sandals) Thanks for sharing such a nice post! Oh I miss wearing skirts without tight.. I love this look! The mix of prints looks really cool. Ahhh I just bought a skirt sort of similar to this, and if it weren't like 20 degrees where I live, I'd be trying out an outfit like this! So cute! Have fun in L.A. this weekend! OHHH, I love this look Nancy! I saw that skirt on Forever 21 and contemplated on buying it and now that I'm seeing it on you and it looks so good I WANT IT!! hahaha! Jealous of your warm sunny weather!! You look lovely, of course! I love that Gap shirt and the pairing with the blue skirt is so cute! Oh and can I say LOVE your shoes!?! I love this outfit, and it makes me wish for warmer weather! LOVE this skirt, fab print mixing! Gorgeous outfit! I love that skirt and your shirt is cute. I love mixing patterns!! 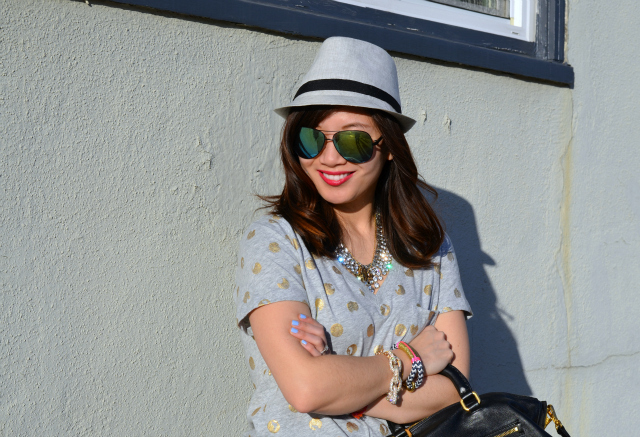 You look so great with the neutral accessories! You look amazing! Love the print mixing and those shoes are adorable! The prints are very quirky and charming together...love those shorts especially. And so nice that you've got a warm spell! Such fun pattern mixing! Love the shirt! 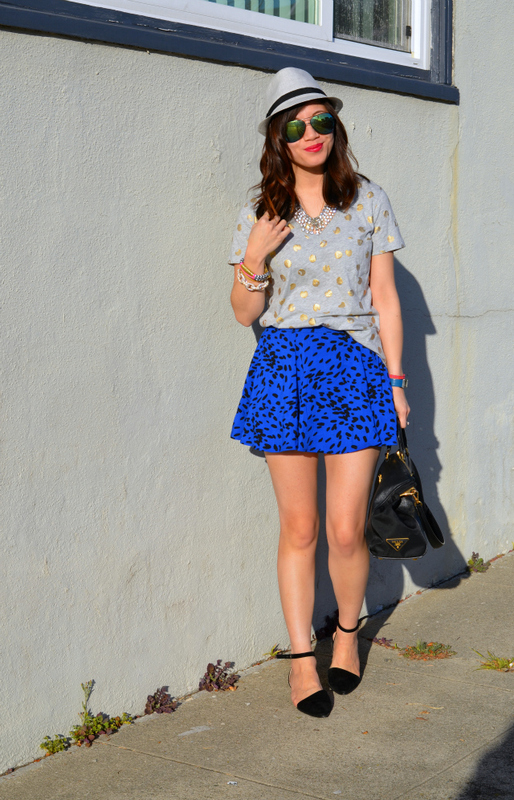 You look gorgeous, absolutley love the polka dot tee and this wonderful printed skirt. I wish it was that warm here!!! haha nancy! you're ready girl! love your top and shoes. This is a great mixing of prints and I love the metallicness of the top! what a cute skirt I was at F21 today how did I miss it. You look adorable. LOVe your bag and shoes!! so chic! What fun pattern mixing! Have fun in LA - it is crazy how warm it's gonna be this weekend! Looking forward to it and spending some fun in the sun. Loving the mix of patterns! Great look! Love the print mixing, Nancy!! Would love to know what you think of my latest outfit post, girl! :) have a good weekend! You look great in this outfit and I love those flats. I love the outfit and I'm jealous you get to spend the weekend in LA. Saturday is almost over for me now in the UK and I'm working tomorrow. Boo. Sooooo lucky -.- Haha, enjoy that warm weather girl! I love these two mixed prints. That skirt is just so adorable - love the bold blue color! and im going to steal that hat. so cute! yup, LA had some beautiful weather this weekend! hope you enjoyed it. love your top btw! You re shoes are lovely!!! I love the shoes! they go perfectly with the outfit! I'm so jealous of the heat! And the fact that you can go out in a t-shirt! The gold polka dots are super pretty, and I really love the shoes. That watch!!! MM!!! I loved that collection. And your gold polka dot top is so cute - I want it! I love the pattern mixing in this one! Very adorable!